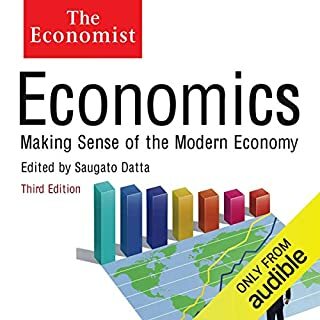 What disappointed you about Economics: Making sense of the Modern Economy? This is a collection of articles that had originally appeared on the pages of The Economist (a British financial magazine). The chapters in the book are edited versions of those articles and they do not blend well together. Yes, it's one of those make-a-book-out-of-a-magazine's-back-catalog efforts. In this case, the back catalog is at least 5 years old and woefully out of date. Economic theories tend to go bad after a few years, and so to the theories put forward in this tome. On the plus side, the actual writing is structurally excellent. The one saving grace about this audiobook is David Thorpe. There are times that I want to listen to a book not for it's content, but as background noise while I work. Mr. Thorpe is excellent in that role. He takes what is dry and boring in this book and reads it in almost a musical manor. Whether that is sufficient weight to overcome the book's shortcomings is debatable.